Art Deco is a style of art and architecture that began in 1920s Paris and continued into the 1930s. Art Deco was inspired by Egyptian and Aztec forms and was characterized by the use of highly stylized geometric forms. 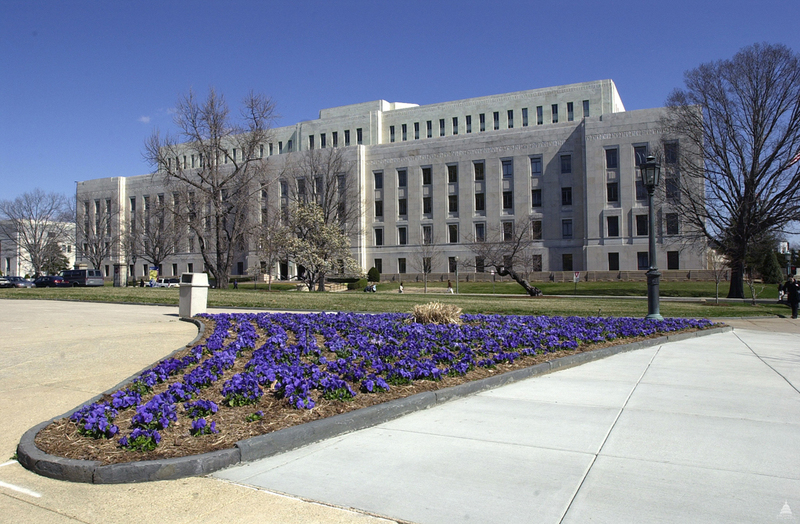 While not a predominant architecture or art style of Capitol Hill, Art Deco is most evident in the architecture and design of the Library of Congress John Adams Building and in decorative elements of the Dirksen Senate Office Building. The Library of Congress John Adams Building, completed in 1939, is an example of detailed but restrained Art Deco design. The exterior is covered by white Georgia marble and then enlivened with a limited amount of carved decoration. Decorative features and metalwork throughout the building are superb examples of Art Deco’s streamlined classicism and decorative cubism. The Dirksen Senate Office Building was built in the 1950s and in order to keep costs low was built of simple design. To add interest to the simple design, the architects added a series of 51 exterior bronze reliefs, square panels with raised designs, between the windows. These reliefs include five subjects: shipping, farming, manufacturing, mining and lumbering. Each is represented by a stylized figure. Additional bronze medallions with symbolic icons can be found on the Dirksen Building's bronze exterior and elevator doors.